Is Hot Chocolate Safe to Drink During Pregnancy? Pregnancy is a time that requires extra care regarding what you eat and drink. You know you should stay away from alcohol, raw fish and cold cuts, but you may worry about drinking hot chocolate due to the caffeine it contains. Most obstetricians recommend keeping your caffeine intake under 200 mg per day, but hot chocolate offers some health benefits, making it a good way to spend your caffeine allotment during pregnancy. The extent to which caffeine could damage a pregnancy is a topic of debate, and studies have shown conflicting results. One such study concluded that consuming more than 200 mg of caffeine each day during pregnancy doubled the risk of miscarriage compared to women who avoided caffeine, reports the March of Dimes. The different brands of hot chocolate contain varying amounts of caffeine, but a cup of homemade prepared with milk has about 5 mg. If you decide to indulge in a cup of hot chocolate during your pregnancy, stick to one serving to keep your caffeine intake within the recommendations, especially if you drink other decaffeinated beverages, such as coffee or soda. If you prepare hot chocolate with milk, you get a good dose of calcium, which supports the healthy growth and development of the baby's bones. 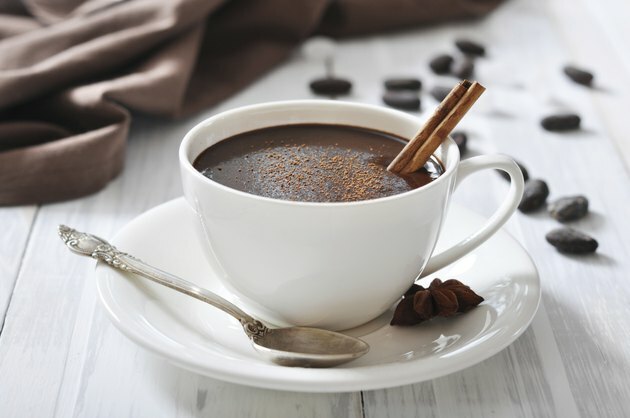 A cup of homemade hot chocolate has 285 mg of calcium, which is also important for nerve, muscle and heart development and aids in blood clotting. If you do not consume enough calcium during your pregnancy you may experience bone loss, which puts you at an increased risk of osteoporosis. Having a cup of hot chocolate occasionally is a good way to prevent this while also helping your baby be born as healthy as possible. You do need extra calories while pregnant to support your growing baby, but you should get those calories from healthy and nutrient-dense foods whenever possible. However, enjoying hot chocolate in moderation is a relatively good way to get some extra calories into your diet, especially if you are having trouble gaining weight according to your doctor's recommendations. A cup of homemade hot chocolate contains about 200 calories, which varies depending on the type of milk you use. Using skim milk means fewer calories than whole milk, but both are a better choice than soda while pregnant. Chocolate, particularly dark chocolate, is a good source of antioxidants, which you benefit from when drinking hot chocolate. While you should limit your intake of hot chocolate during pregnancy, those antioxidants offer benefits for both you and your fetus. Antioxidants work by fighting free radical damage that occurs due to environmental exposure and which contributes to the development of health problems that include heart disease and cancer. In addition, "The American Journal of Clinical Nutrition" found that mothers who had a high intake of antioxidants during pregnancy gave birth to babies who showed less incidence of asthma and other wheezing disorders in early childhood. Does Hot Chocolate Relieve an Upset Stomach?